I have used it for the last 4 years to keep track of ALL of our lesson plans. It use to just be a Unit Planner because that was how we schooled. But now it is a "Lesson Planner" and I keep forgetting to change the label! It functions well for our family, everything in one place. Especially since I have found lesson plans in list form, vs. the ones written in each day, to be more conducive to our family and learning styles (more wiggle room). It looks like a mess from here, and the key to the "code" I use for materials is at the bottom of the page. But, really, this way is soooo great for keeping track of how far we are, what we have left, and so on. Recently I pulled the History and Science tabs out and tucked them into my folder to take to the library and review while the kids worked (I didn't want to cart the binder because we were walking and I was cutting down on weight to carry). However, I ended up busy going through other paperwork while we were there and the tabs stayed in my folder for a few weeks as our family endured sickness and business of various kinds. I tallied up weeks left (we aim to be done before the boys' birthdays in the first week of June... long story for another day). It didn't look good. We seemed hopelessly off course. 18 weeks worth of work and only 13-14 weeks left of school. Are we doing what God has called us to do? Is God's work noticeable in my life? Are we on fire for God's work? Then I looked at the sub notes under the questions. I remembered it being a list of check points I had noted from somewhere else. I was planning on using them for some other work I am doing... and forgot! 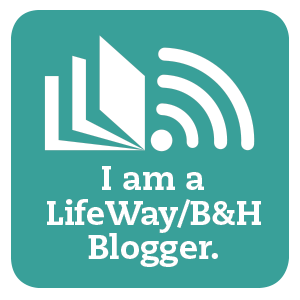 I also realized the core of a faithful homeschool should be reflecting these values. We don't need to be geniuses (God can and does use even the foolish things of this world...) but we need to grow the abilities God has given us. Faith + knowledge = impressive! God's Word gives life... is it at the center of every day? Not just a.m. study... but in understanding all aspects of each day. Do I turn to him when I struggle with my school work? Are my words and actions measured with love... where can I improve? Do we take opportunities to do for others and share during our day? Are we sharing about Jesus with others? 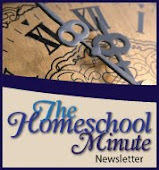 As I looked back at my lists I realized God was reminding me of the value of HIM at the center of our homeschool. So we are off schedule a bit... it will all work out. Reading those extra few books, taking un-lesson related field trips, doing fun and messy un-time restricted projects... that can still be done through the summer (and boy, I can't wait for summer now!). For now, we still have a lot of fun, interactive and exciting things left to do this school year. But the most exciting part of all is remembering WHO we are schooling for and why the forward motion (not necessarily the speed) is what progresses us to that final Destination... and isn't that Destination grand!?! I pray you have peace no matter where you are in your lesson plans... to know Who you travel with makes the progress towards your destination that much more fun! Great lesson plan binder! I used to keep one similar, but became "more relaxed" with lesson planning and haven't kept one in a few years. I do keep a simple calendar of random thoughts, notes and activities though. It's important to have something that works WITH you! Sometimes it's o.k. to get off schedule, or even let go of some things we had planned. Evaluation and reflection help guide us, doesn't it? Sounds like you and your boys are surely on the right path. You are an encouragment to others, myself included. Thanks for sharing. 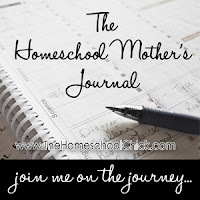 Jackie--A Homeschooling Mom who enjoys blogging and living on a farm. Thank you both for blessing me with your comments!